Let's start, shall we. 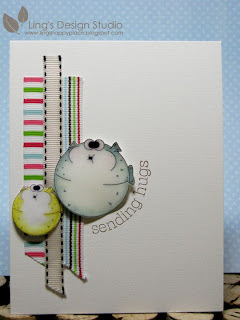 Today I want to show you the latest digital stamp from mami Doodles. Elisa is just so talented and all she wants is for us to have fun while presenting her stuff. With the stuff that she came up with, it sure is easy to have fun. This particular image, she made it per my request. I have this thing for snail. No, not the actual snail, but the image of snail. LOL. It first start when I found Suzy's Zoo. Love, love her stuff! I visited their corporate office in San Diego twice! And yes, that's my dream office. Wall full of cute drawings. I even named my pug, Ollie based on one of her characters. Okay, okay, back to the snail story. One of Suzy's Zoo character is a snail. Then, when I was in Antwerp, Belgium, I found this cute snail stuff animal. From there, it just kind of love snail drawings. I even drawed one that actually made it into Suzy's Zoo newsletter magazine back in the day. 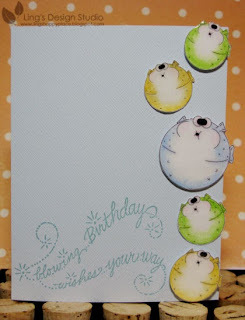 So, I mentioned it to Elisa that it would be so lovely to have cute snail stamps. 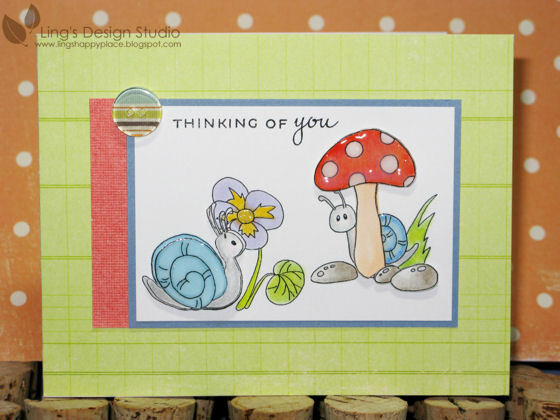 Now, for my second card, I resize the snails very small, since I want the "Best Friends" to be the main focus. I had so much fun coloring them. You can get them here. I hope you'll join us for our 2nd challenge. Go to Mami Doodles blog to check all the detail. 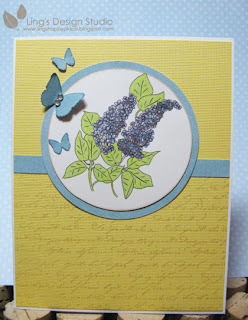 The challenge is to create anything with garden theme and use at least 1 ribbon (which I missed, sorry about that). It can be any project and you don't have to use any of the images from this shop. You have till midnight, Wednesday 12th. Leaving comments on Mami Doodles blog, also give you a chance to win prize. Go check it out! I am looking forward to see what you come up with and don't forget to check out all the other Mami Doodles DT member created. As always, these girls amazed me. You have anything plan this weekend? It's national Scrapbook Day! I am so hoping to complete a couple scrapbook pages (see, I am realistic, I said a couple not some), if my lazyness doesn't kick in. Hah... I am hoping for productive, but relaxing weekend and wish you all a happy weekend. Thanks for stopping by. TGIF! Hi there, sorry I was missing for a couple days. Just needed a short break from the card making. Works has been crazy busy, that when I come home I am just pooped. And on top of that I wasn't feeling too well. :( I've been having dizziness spell quite a bit. Please bear with me if I don't post as often this week or next week. All depends on how I'm feeling. Anyhoo, I did completed this week Digi Doodle Shop's Best Challenge a couple days ago. This week the challenge is everything goes. Couldn't be any easier. And also, now they start offering free digital stamp for you to play with. Way to go to expand your digital stamp collection! 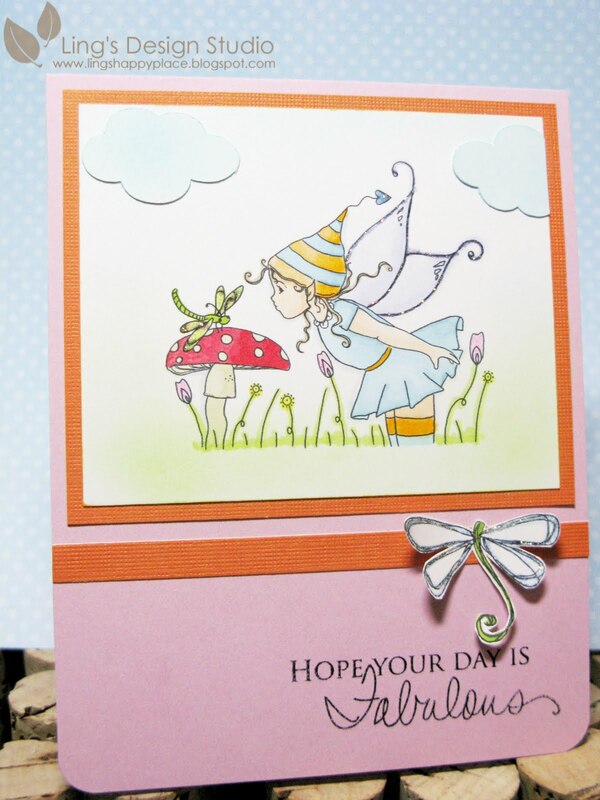 Also, the prize for this week challenge is S15.00 gift certificate from Whimsy Stamps. How awesome is that? I have to use the puffer fish again. I just loved the look of it. It's way too cute and yes, I keep it simple, so the puffer fish really stand out. Basically, I reuse the sketch from Sweet Sunday Sketch. There's just something about simplicity that I adore. I feel like it makes me feel lighter, the way I feel when I just cleaned my room. :)I just love clean, simple design. So, what ya' waiting for? Come check out the DDSB challenge blog for all the details and hope you'll play. Looking forward to check out what you create. Have a great Thursday. Hugs, Vera. Today is my 2nd time my works being featured at Love My Tapes blog. I get to show different ways of using the washi tape again. You can check it out here. Let's get on with it, shall we?? 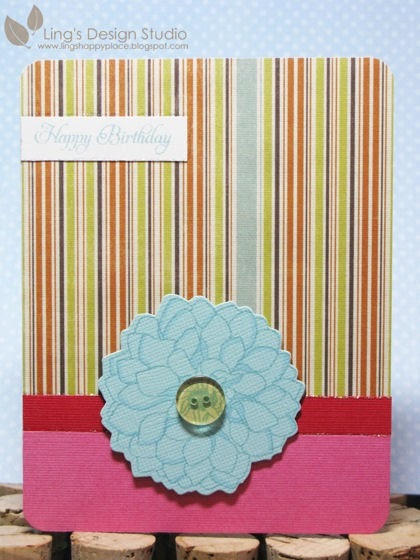 For my 1st card, I used the Akane washi tape to make the flowers. Since the washi tape is pretty sticky, it makes it easy that I don't have to put any glue on the circle base. I basically just did the accordion fold following the circle. The washi tape is sticky but not crazy sticky (just like paint tape, you can reposition it after you just out in on. Warning, it will stick to your paper for good after a while), so I can adjust and readjust the fold. I made this card using Sweet Sunday Sketch # 66. Finally, my last card. Can you guess where I used it? Hint: so far, I am showing the Akane one (yellow), because that's what I received on my package. Yep, this time I used only a small piece of the tape. It's behind the button! I need to get the washi tape in different colors, as they all very yummy and very practical to use. 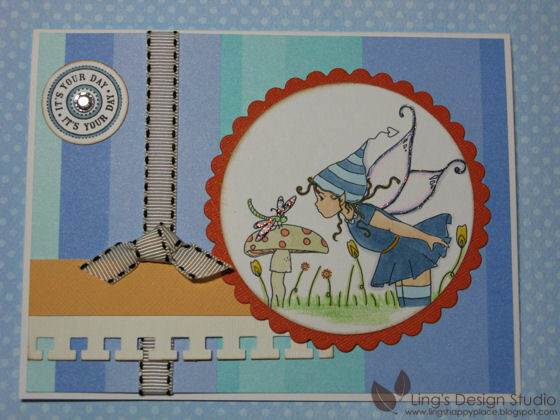 Beside the washi tape, Loves My Tapes also offers Permanent Double Sided Adhesive. They works great. Basically, all my cards this past weeks that required any layering were made using Loves My Tape. 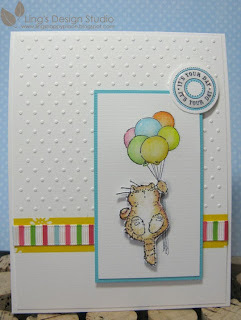 See my post from yesterday, here, where I used it with tissue paper (1st card). You can't even see it. What do you think? Would washi tape be on your wish list anytime soon? They have the double sided adhesive special right now, so go and check it out. Also, just a reminder, you still have time to play Digi Doodle Shop's Best color challenge for a chance to win free stamps & guest designer spot. Thanks for stopping by peeps. May your week be great one! Hugs, Vera. Hi peeps, it's my favorite time of the month again! Time for Papertrey blog hop. Requirement for today blog hop is to use tissue paper. Honestly, I was struggling a bit at first. I saw so many sample of flower made of tissue paper and I thought I give it a try. Didn't work out. I lost my patience... LOL. After several attempt, I decided to try different thing. First, I found out that stamping on tissue paper can give you soft look result. And by accident, I also found out that I love the look, when I layered the tissue paper 3 times. If only 1 layer, it will show whatever other colors you have on the background. 2 layers, still didn't quite give me the look I like. So, 3 layers it is. 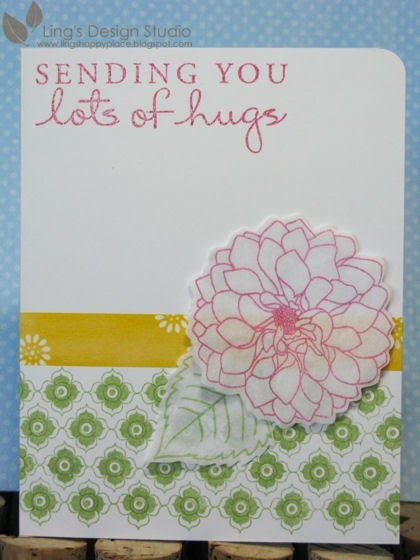 :) Here's the first card, all I did was die-cutting the flower & the leave, then stamped the Delightful Dahlia set. I am looking forward to seeing everybody's creation tonight. I know I am going to be overload with inspirations and for that I thank you all. And a big thank you for everybody that stopping by my blog. Please kindly leave a comment as your comments means a lot to me and I apreciate each and every single one of them. I'm gonna get comfy and start hopping! :) Hugs, Vera. Happy weekend, peeps! How are you all doing this weekend? This past Thursday I got a last minute request from my SIL. It's basically for my niece, Maddy. Her school have this silent auction going on and each classroom made a goody basket and turned out they needed to make a sign for their basket. The auction was on Friday, and they found out on Thursday. How's that for last minute? I love my niece and find it hard to say no. Besides, I am such a sucker for this kind of project. Nothing like working under pressure. Love the challenge. :) As soon as I got home from work, I started working on it as I have my 7pm, Flash Forward show to watch. I found this cute Sassy Cheryl's digital stamp. I forgot to take picture to show the layers I created. There's actually 3 layers on the girl. I love the dimension it created. I colored each layer (with Prismacolor pencils), too, so if people peeked from the side, they can see all the layers are colored. I thought of only coloring the top layer, but my perfectionism won. It would have bugged me if I didn't colored it. LOL. All in all, for last minute request, between searching for image and making the sign, it took me about an hour and I thought it came out fun looking. My SIL said many people at the school asked her about it. It's always fun to hear that others appreciate what we created. Am getting ready to grab some breakfast. Hope you all have a great weekend. Hugs, Vera. Happy Thursday, peeps! I am excited to show you my card for Digi Doodle Shop color challenge. I thought the card came out pretty cute and fun looking. I just loved, loved the way the puffer fish look. Truly, this fish make me smile everytime I look at it, because it just look so darn cute! There's 4 images in this one set and you can get it here. What's the challenge? For this week it's color challenge. 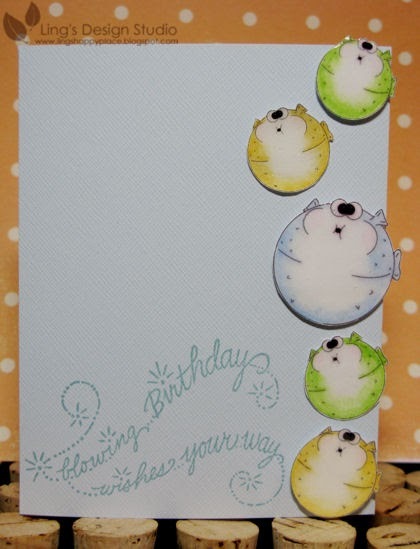 Create any card, using any stamps you want (although if you use Digi Doodle stamps, you get extra point), using this color combo: robin blue, grass green, buttercup yellow, and a neutral color (could be white or kraft). For my card, I resize the puffer fish in several different sizes, colored them with Prismacolor pencils, then cut them all one by one. Attached 3 of the fish with pop dots and the other 2 just glued directly to the paper. Of course, I couldn't do fish without glossy accents. Isn't it cute how the biggest puffer fish looks so shiny. And, I thought the greeting is perfect. "Blowing birthday wishes"...., see how the puffer fish looks like their blowing?? Blowing wishes.... Maybe I am silly, but I was giggling when I thought about it. LOL. I got the idea for the card from Clean & Simple FTL86 sketch. It's simple sketch, but I love it. It was a very fun sketch. And I did turn it vertically, instead of doing it horizontally like the sketch shown. And this card also perfect for Paper Play Challenge this week. So, come on over to Digi Doodle Shop's Best Challenge blog to get all the details and join us for a fun color challenge. remember, you don't have to use our stamp, but if you do, you'll get an extra point. And the prize... free stamps! You have 1 week to enter this challenge and I can't wait to see what you come up with. :) Hugs, Vera. This time, I am following the sketches from 2s4Y. 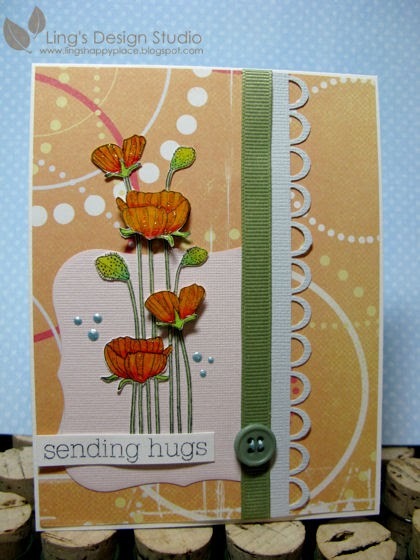 I used Hero Arts Poppy stamp for this card. And, I was impressed when my husband made the comment of how neat I highlighted each of the stems with the shiny stuff. LOL. I was like, you noticed that? Sigh... have to love a husband who pay attention to the little details. Then he said, of course he paid attention to what I made because he's proud of my creativity and he loves seeing how much I enjoy doing it. Aww... heart melt. :) Seriously, how could I not melt when I heard that?? I am so lucky to have someone who's so supportive of my hobby. So, here's the card. 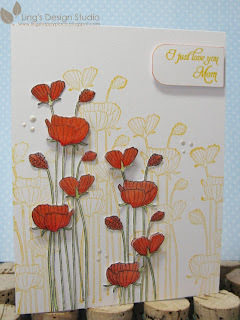 Hand cut this delicate image, higlighted the poppies with glitters and the stem with Glossy Accents (or as my husband say that shiny stuff). I haven't do the Mojo Monday challenge for awhile now. But, I like this week sketch, so I decided to play. 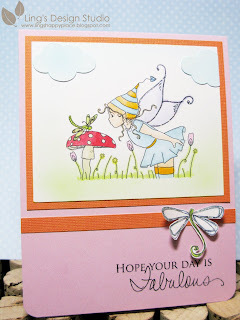 I am using the Lilybean fairy again as I do love how cute they look. The good thing about digital stamp is I can resize and print a bunch of them ahead of time, which is great for those spur of the moment kind of thing. The bad thing? LOL, now beside my pile of scrap papers, I have to find way to organize those digital stamps that I printed. As much as I try to use up the pile that I already have, sometime you just have to print some new ones and then the pile just get larger and larger. Right now, I just put them in envelopes. Maybe I should put them in ziploc, so I don't have to open each envelope just to see what's in there. Any suggestion? OK, here's the card, before I keep rambling with no direction. :) As always, am sticking to simple and quick. I think I'll skip card making tonight as I have "Lost" to watch. As much as I am curious to see the end, to understand the whole island thing, I will really miss this show. Right now I have 3 shows that I watched consistently, which are Lost, Flash Forward, and Gray's Anatomy. I was trying to watch Glee, but they're the same time with Lost, so I'll catch up online and then maybe after Lost done, I'll watch that! Before I forget, there's still time to join the Mami Doodle color challenge. 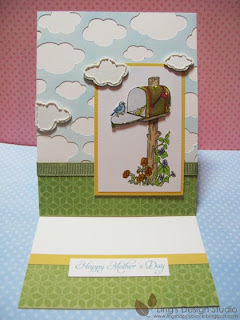 You can use any stamp you want and when you play, you can win the Midori stamp and an additional stamp of your choice. So, please join. And, I'm doing a little giveaway, too. If you join the Mami Doodles challenge, leave me a comment here on my blog to let me know and I'll add your name on the list, for a chance to win some goodies. Okay peeps, hope you all have a wonderful day!! Today, I am featured on Love My Tapes. So excited!! A couple months ago, I was chosen as one of the lucky person that get to try their products, which include permanent adhesive and the popular washi tape. I have to say, I do love the versatility of the washi tape. 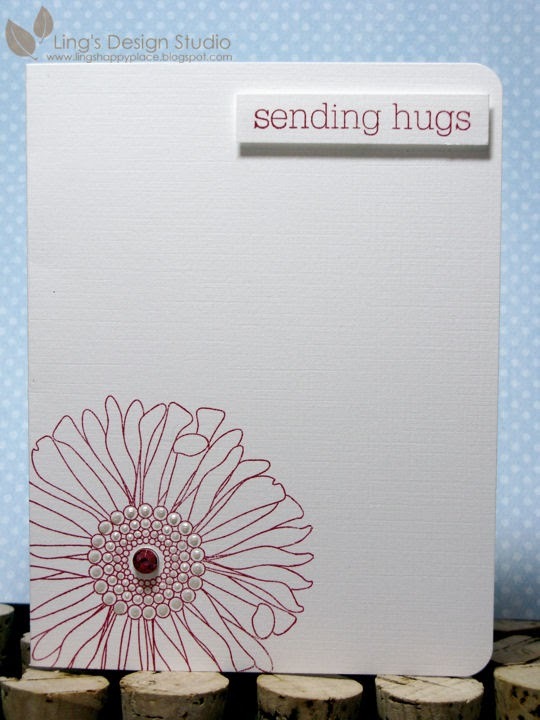 They are pretty to start with and you can use them for quick border or go for more elaborate stuff. Washi tapes is from Japan and kind of like paint tape, except they're way prettier. One roll will last you a good while as the roll is pretty thick. You can find them here. And, if you read my previous post a couple days ago, you know I've been talking about how I find it challenging working with the color yellow. LOL. 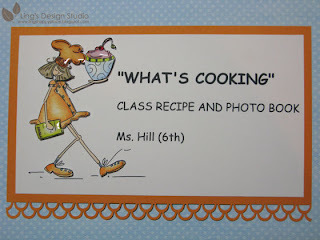 Being spotlighted, I was worried if the cards I made were too simple. But, then again, that's my card style and at the end I chose to stay true to my style. So, let's see what I came up with. Here's the 1st card. Here, I taped several row of Akane washi tape on white cardstock and stamped it with the flower from Papertrey Ink Friends Till The End set. 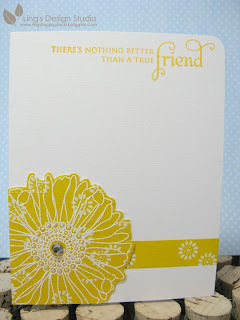 Used white embossing powder to match the brightness of the daisy on the tape. The tape can be embossed, just be careful not to bend the cardstock afterwards, cause it can flake. Otherwise it works like a charm. Next is the 2nd card I made. 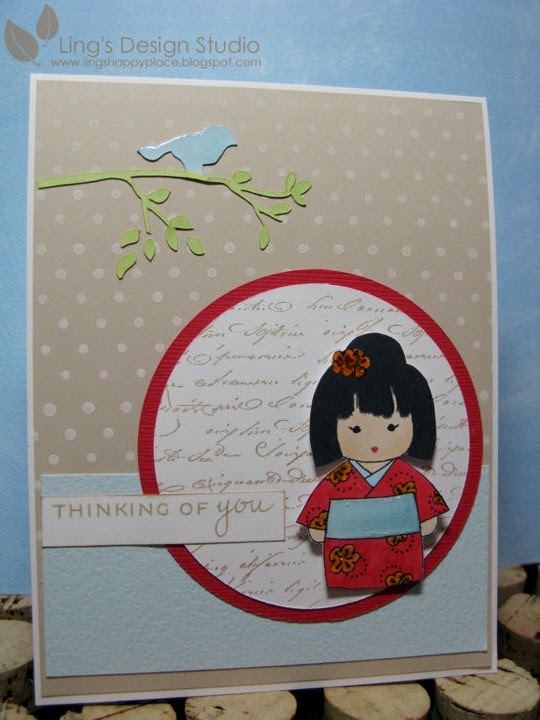 This second card, I simply used the Akane washi tape for borders. 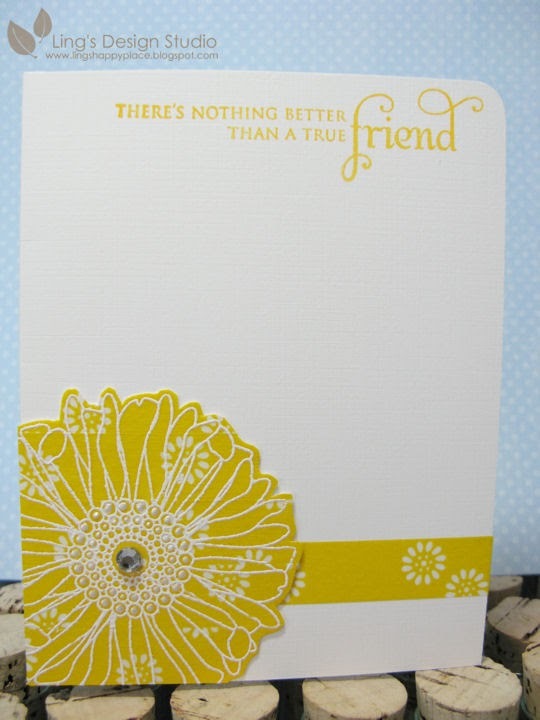 Since, I don't usually use yellow cardstock, I don't keep them in stock. In occasion like this, the washi tape is awesome when all you want to do is to add a bit of that certain color as border. The cat is from Penny Black, colored with Prismacolor pencils. Greeting from Hero Arts. Please let me know what you think. 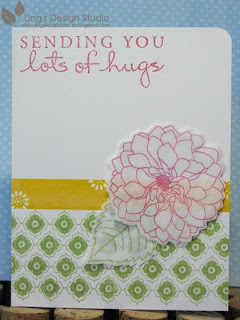 And don't forget to check Love My Tapes blog. Next week, I'll have more cards featured and hopefully this week, I'll have more inspiration on using yellow! I really appreciate any comments you leave and each time, I hope I am able to inspire you to create. Thank you for sharing this exciting day with me. Hugs, Vera. I made this card a couple weeks ago, just didn't get to post it here. It's a super quick card. No coloring required. The only detail I add was the perfect pearl on the center of the flowers. My hand was shaking a bit, when I did that as the dots getting smaller. As card maker, isn't it funny that sometime we have the patience to do detail works and can be so impatient with other things. Most people think I must have lots of patience since I often do such detail works with my cards. The truth is, I don't consider myself as someone like that. When I want something done, I have hard time waiting, especially when it's job related. I don't like to keep people waiting either. It runs in the family. LOL. I don't consider it as flaw, we're just very efficient. How's that? Anyhoo, how did I get to that? My brain have tendency to ramble sometimes. :) Back to the card. Here it is. Very simple and if you ever need to make a whole set, you can accomplish this in minutes! Enjoy your Sunday! Hugs, Vera. Hi'ya there peeps. Today, I am buried in my desk and feeling stumped at the same time. This week, I am seriously struggling with my creativity. I mean, I have all kind of ideas swirling in my heads, been jotting down ideas on my sketch book, etc., yet when I sit down on my desk, I just don't quite know what to do. I think, sometimes, when I have too many ideas, I get overwhelmed. I really need to just decompress and declutter my desk. Usually, I can create card pretty quick. But, not this week. Took me forever to complete any card. As much as I love colors, anything that involve yellow would stumped me to no end. I've been stressing out the whole week about using yellow. Oh well, you'll see on Monday what I am talking about. 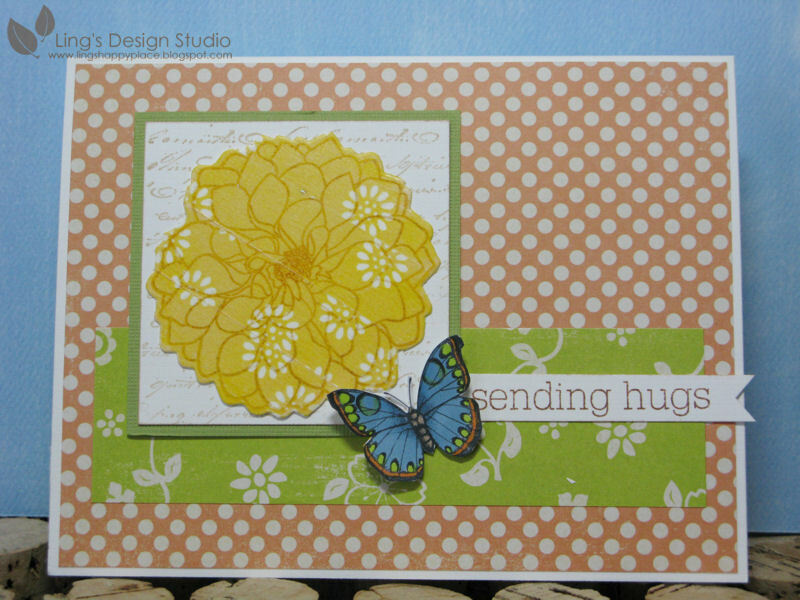 Meanwhile, this is a card that I made for Hero Arts challenge and yes, it does have some kind of yellow. I can't get yellow out of my mind. LOL, didn't I tell you color can affect me so much?? After this week, I think I'll get away from yellow for awhile. :) This card, had me staring at my desk for awhile. Not quite sure how to finish it, then I was crazy enough to do layers. Oh my gosh, the detail, the cutting, I was about ready to give up. Anyhooo, this is the end result. Pretty happy with the way it looks. And I know my mom will love this! :) I colored the poppy with my prismacolor pencils this time. Mixing the red and orange, then cover it with the glossy accent. 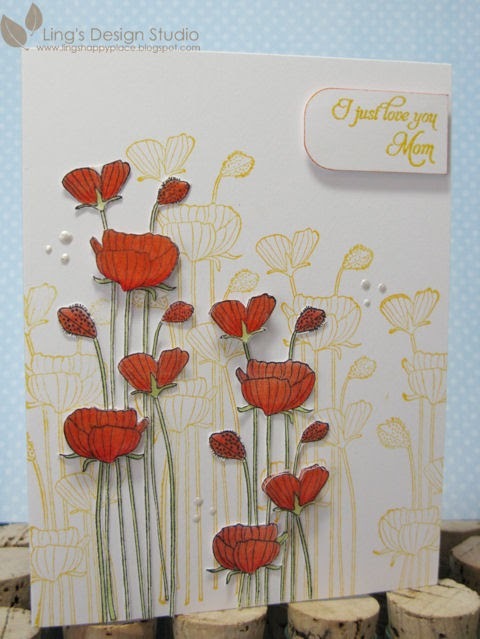 To create dimension, most of the poppy blossoms are popped with pop dots. Okay, hope you enjoy your weekend. Husband calling. Time to go grab some italian ice cream! :) Ciao! Today, I am unveiling my work as Mami Doodles DT member. You definitely need to check Mami Doodles blog. Oh my gosh, I was speechless when I saw what the other girls created. They're stuff are so awesome. I am in awe by their talents. I have so much to learn from them. 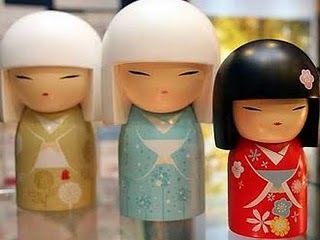 One of their digital stamp, is this one called Midori. You can get her here. The price is soooo reasonable. You'll get a few variation from this 1 set. If you see what the other girl created, you'll be so inspired. I am thinking of making one for wall display like Elisa (Mami Doodles) did. We also have a color challenge going that I hope you will join. Please join and you can win free stamps. You can find the detail here. 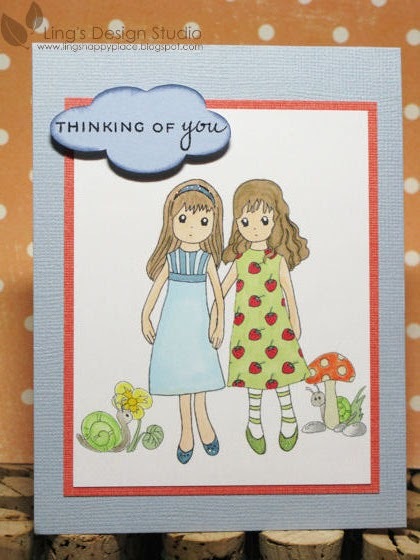 Also, from my part, if you join the challenge and left a comment here that you join the challenge (add your blog link, so I can see your work), I will send you some goodies, too, that will include some of the cards I have made and some other surprise. And here's the card that I made for the challenge. It's basically a hybrid card. Midori is digital stamp, the rest is Papertrey Ink & Stampendous stamp. The tree branch and the bird is from Quickutz Silhouette colored with Copic. Extra glitters and glazed diamond here and there. So, what you think? Please leave a comment and if you have any suggestion for digital stamp please doo so and I will let the talented Elisa knows. Happy Friday, peeps! Hugs, Vera. Hi there peeps! How are you doing this morning? I love Thursday. Cause it means one more day before weekend and I have my favorite shows on tonight. Flash Forwards and Gray's Anatomy. Let's start with Digi Doodles Shop's Best (DDSB) challenge for today, shall we. This time it's a sketch challenge. You can see all the detail and the sketch here on DDSB challenge blog. You can win free stamps and win the chance to be our featured guest designer, so I hope you will join the challenge. Here's my take on this week sketch. I highlighted the lilac with glitters once I am done with coloring it. Sorry, if the picture is not too great. I have the hardest time taking picture of yellow cards. Somehow it just never quite as good as the way they look in real life. You can get the lilac stamp here. Please take the time to browse around the shop. 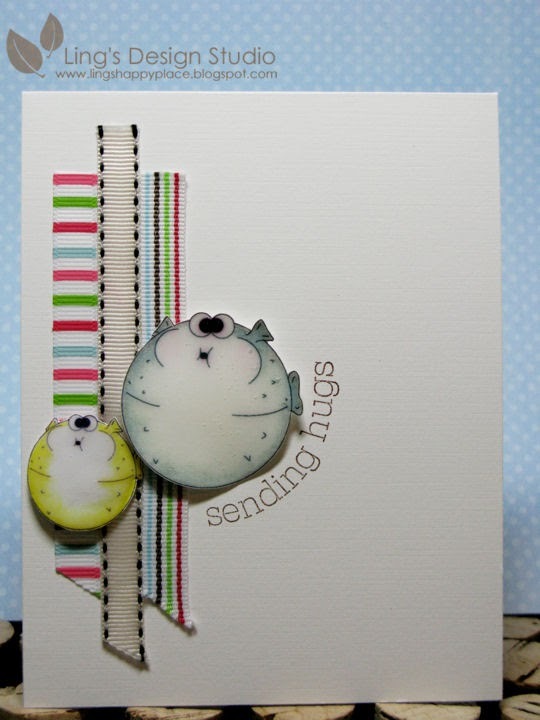 They have lots of cute images, from cutesy to vintage for you to play with. I am looking forward to see your creation for our challenge. Hugs, Vera. Monday late afternoon, we were at home, when suddenly I just hear my husband cursing. Went to check on him and found him holding up his hand that was covered with blood. He was working on a project and his pocket knife fold on him (yeah, it's the one that didn't have safety lock) and just cut him open. He's more annoyed that it happened instead of thinking of the pain. He thought he could just duct tape it. Must be a guy thing that duct tape can solve everything. Since his tetanus shot not current, I insisted on going to the emergency care by our house. Besides it was pretty deep cut. He was still trying to debate me and I just gave him the look that pretty much said don't even try. I have to say that I am very impressed with St. Michael emergency center. We thought it's only a minor emergency center, turned out it's they are the smallest fully functional hospital in Texas. As soon as we came in they took his information and no waiting! How amazing is that? I never been to any emergency center where there's no waiting. And the staff?? AWESOME! Very friendly and efficient. John, himself used to be a paramedic, I think that's why he's so calm, too. He knows what's what. And he's so thoughtful. The whole time we were in there, while they're stitching his hand, he joke around and make the doctor and the nurses laugh. I was like, I never seen anybody that cheerful during injury. And his explanation was that he remembered from his paramedic year, how it can be so depressing working in hospital and he said it's refreshing when you have patients that just don't whine and complaint. He said, I can brighten their work day by making them laugh. And he sure did. He made them laugh with his jokes, took pictures while they stitched him up. Later on, he said that he also did it for me cause he didn't want me to stress out. And, I'm like, you're injured, yet you think about my well being and others. I married an amazing man! He's just so thoughtful of others. I told him though, he didn't have to worry about me in that kind of situation, as I do have my mom's gene in me. LOL. I have that tendency, when the others around me freak out, or get hurt, somehow it forced me to be calm and efficient as my mom always thought me to act efficiently we need to be calm. And yes, my mom used to be a nurse, too. So, that's my exciting Monday evening. Tuesday evening is my time to watch Lost. Only a few episode left. This final season has been good! Didn't have card made for today's post. I am working on some cards, but they all to be post for my DT project. I figure I can post an old card I made for my boss' wedding last year. It's a pull out card. I'll be back with new cards tomorrow. Thank you all for stopping by. Have a great Wednesday! Hugs, Vera. Elisa was just blog hopping, checking out different blog and she found my blog from one of the challenge I entered. She fell in love with my style and out of the blue, I got this email asking me if I'd be interested to be in her design team. For me, that was such a huge compliments and I am excited to be part of her team. The next few months should keep me busy being in 2 design teams. Both companies have beautiful stamps to work with, but each quite different in style. So, there should be plenty of images to play with. Here's a sample of Mami Doodle's stamp. First, I cut a Bo Bunny's dot paper for background and cut a hole in the middle. 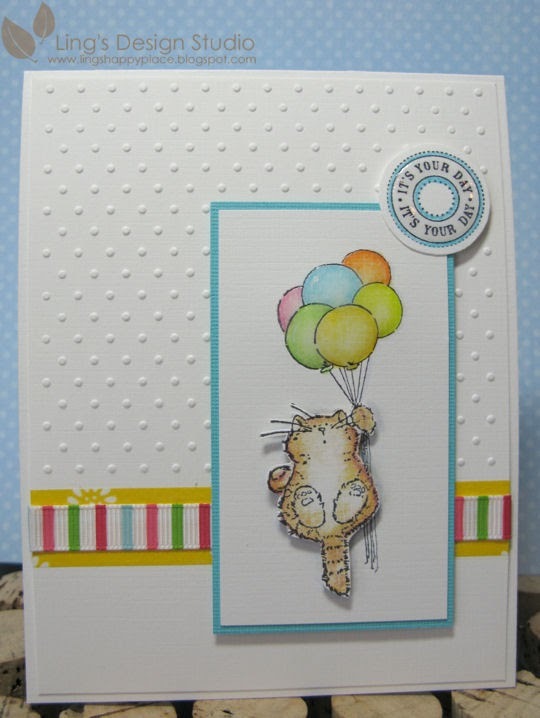 I attached this to the card base using pop dots. Also, for extra element, I added the dandellion cut with Silhouette. I colored the girl & the cat with Copic markers, I cut around her image and glued her on top of the circle opening. I don't usually work with bright colors, so using this lime green background was quite a bit outside my comfort zone. But, I think it come out pretty good. You can see all the goodies available at Mami Doodles starting on Thursday, April 15, 2010. We will also have challenges that you can enter. Hope you can join us. Hugs, Vera. Quick post. Made this card for my father-in-law's birthday. He's celebrating his 71st birthday. Am also entering this card for SRM challenge. Sorry for super short post. Have loads of things to do. :) Have a great night. My weekend start with making card. Hah... how's that for exciting way to start? :) I made this card for Nina's blog anniversary challenge. I recently found this Lilybean fairy stamp and eventhough I was a bit intimidated in coloring her, I think it turned out pretty good. Love how cute she looks. For extra detail, I added a couple clouds just because that space looks a bit empty. And of course, I have to add glitters to the wings. Here's an upclose look of the wings. Love my stickles! The dragonfly actually have glitters, too. 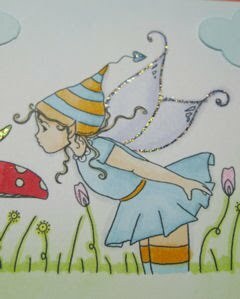 I think whenever I work with fairies or dragonfly stamps, I always add glitters to the wings. Otherwise it just doesn't feel complete. So, what do you think of this Lilybean fairy? This one is called Clover dancing with dragonflies. I also want to do a birthday shout-out to my gal, Monika in Germany. Today is her birthday and I want to wish her the very best. I met Monika through Hero Arts flickr group. By the way, Monika, your card is in the mail along with your goodies. :) Okay, peeps, that's all for now. Hope you have a wonderful & fabulous weekend. Ciao! Aaahhh.... Friday!! Happy dance. 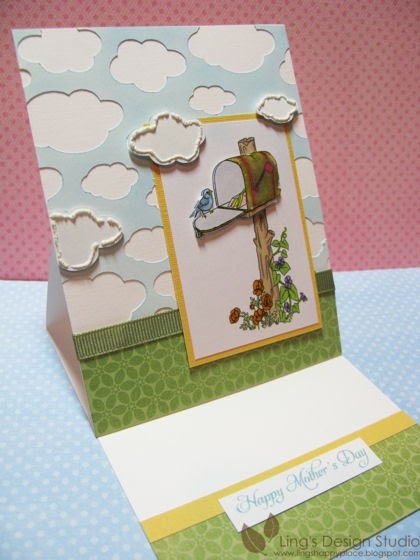 I am so looking forward to this weekend as I plan to bury myself in my scrapbooking room while my husband busy watching the Master golf tournament. I found a blog that just focus on print and patterns and let me tell ya... I've been so inspired. My doodling book been filled with ideas. The only thing that irritate me sometime was that when I tried to do the doodling again, somehow they don't look as cute as the original doodling. I guess when I did the doodling without thinking, there was no pressure, so it just come out naturally. But, when I am ready to use it for actual use, I get worried about messing it up, etc., that sometimes it took me several tries before it come out the way I want it. I also have to make several cards for Love My Tape as they will be featuring my works on April 19th and 26th on their blog. So, so excited with this opportunity! Please check my blog on that date, too as I will post the cards here as well. On to today's card. 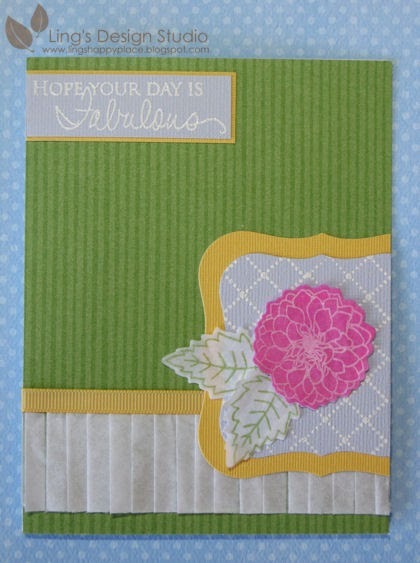 I made this card for Moxie Fab Tuesday Trigger. The inspiration is to create a project that mix aqua with kraft, orange-gold, red and pink. Not your usual color combo, but it turned out pretty yummy, in my opinion. Okay, that's it for today. I wish you all a very happy Friday!! Hugs, Vera. Only a week ago we celebrated the grand opening of Digi Doodle Shop. I hope you get to join their first challenge. If not, you can join us for challenge # 2. 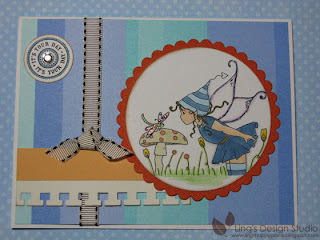 You can find all the details for this challenge by going to Digi Doodle Shop's Best Challenge blog. 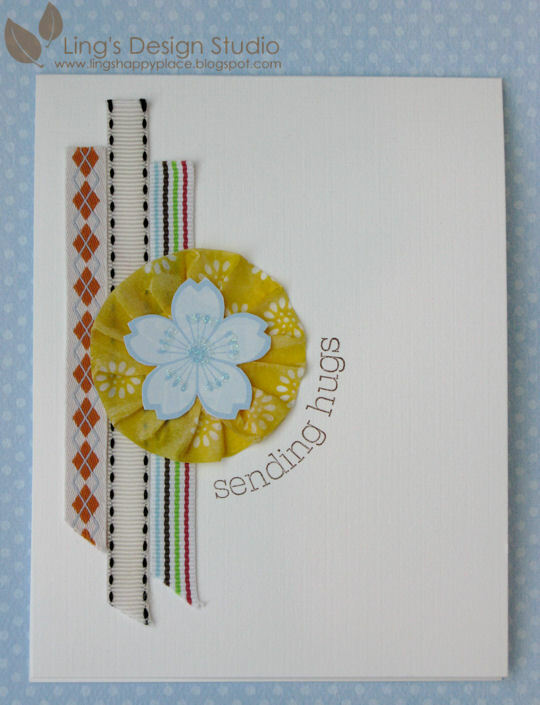 This week the challenge is to create card with different folding. 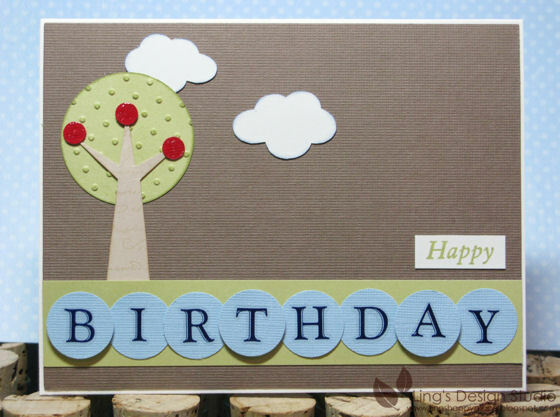 If you have followed me for a while, you know I love making easel card. So, that's what I made. I love this sweet Digi Doodle Shop's mail box image. You can get this stamp here. For the background, I turned to my Silhouette machine. Don't you love that cloud?? I've been wanting to use this Hero Arts cloud image and this is just perfect. And, I love the fact that I can use the inside of the die-cut for extra dimension. To create the soft background, I used chalks in 2 different shades of aqua blue. The little extra puff on the cloud is created by using Liquid Applique. Don't forget to check out all the other blog by our DT. Their links on the left side of my blog. Let me know what you think and join us for the fun challenge!! Hugs, Vera. I've been planning all along to do a blog shout out to my older brother, Jeff, on his birthday. My bad... Due to stressfull work situation last week, I totally failed to do so. Today's post is all for my brother! There's only 3 kids in our family. My older brother Jeff, me and my younger brother, Jerry. Jeff is five years older than me and he's truly a big brother to look up to. Actually my husband points this out to me, how lucky I am to have such a good role model growing up. Looking back, as much as I got mad at him when he was bossy (teenage years), I have to say besides my parents, my brother helped shapes who I am today. He's my mom's helper in watching us. I just want him to know that I appreciate all his good examples. He's a quiet guy, except when all of us together, he can gets very goofy and I love that. So, no cards for today's post. Just a belated birthday blog-shout-out to my older brother who I love dearly and appreciated so very much. I don't get to see my brothers that often, but they're close to my heart always. Jeff, happy, happy birthday. May all your wishes come true and I am so lucky to have you as my big brother! Love ya, Ling. How was your Easter? We went to Galveston to visit my in-laws and had a wonderful super-big-lunch. My SIL and her family were also in town visiting from Galena, IL. They have 4 little kids (one actually still a baby) and let me just tell you, sitting for lunch with 4 little kids, made a very interesting time. They're adorable, but when their restlesness or the sugar high kick in, wow, you better have your running shoes ready, because they will just take-off! After lunch we went to the beach. It wasn't the best day to go to the beach because it was so windy, but we all still had a great time. As soon as we got back home, it's pretty much sofa time. LOL. I was whooped. Besides, I have my show on. Have you heard of the show "Life"? It's an 11 weeks special event on Discovery channel about all kind of living things on earth. And the pictures are just AMAZING! Some makes you wonder how on earth they captured that? So, if you haven't seen it, try to catch it next Sunday. Here it starts at 7pm CST. The pictures and beauty of life will just captured you. Speaking about animals, yesterday they were showing about birds. How perfect is that theme for my cards. 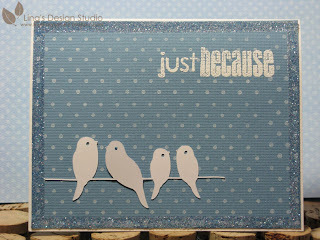 Beside butterflies, I used birds quite a bit on my cards. Here, I used Silhouette to cut my birdies. The 2nd bird from the left is popped on pop-dot for a little extra dimension. Covered all the edges with glitters. Pretty quick and simple card. OK, I better get going. There's still so many things to do on my list. Hope you all have a great week. Hugs, Vera. Yay... today is the day!! Today is the grand opening of Digi Doodle Shop store. I am so excited to be part of Digi Doodle Shop's Best Design Team. They have lots of digital stamps that I am so looking forward to play with. You can check out their digital stamp collection here. You definitely want to check it out today, cause the first 50 customers of the store will be put in for a drawing to win their very own CUSTOM MADE STAMP. Yep, you read it right. You can send in your picture, your kids picture, or your puppy and they can create your very own custom stamp! One of the lady on the DT, had a couple stamps made of her cute puppies. Way too adorable. When you visit the store, don't forget to sign up for the weekly newsletter, so you can get up-date for new releases. And of course, we can't do grand opening without doing challenge. 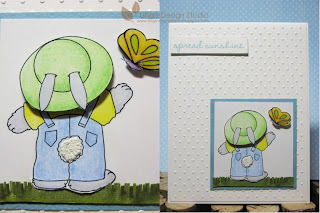 This week challenge is to make card with Easter/spring theme. You can join the fun and get the detail for the challenge by going to Digi Doodle Shop's Best here. Every week we will have new challenge. How fun is that? I actually ended up making 2 cards for this week challenge. 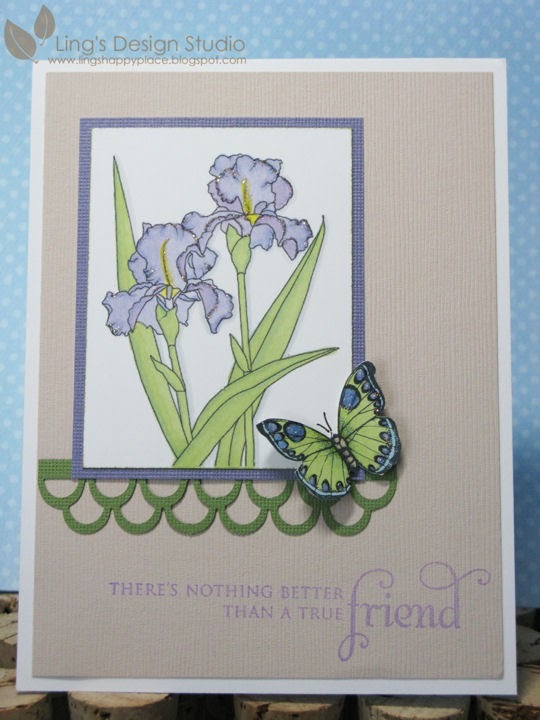 The 1st card I used the iris bloom. During the sneak peek a few post ago, I did the same flowers but colored it yellow. Here, I used purple. I colored the image with copic markers and then for the scallop border I used Martha Stewart border punch. The second card, I used the Boy Bunny image. He looks so sweet and playful. I also included the up-close pic of the bunny tail. To make it looks fluffy, I used Liquid Applique. I don't get to use it often, so kind of glad that I get to play with it this time. And for extra dimesnion, I create layer for the bunny's hat and the butterfly. I love that they have stamp for evey taste. From the classic, vintage look to the cutesy stuff. Let me know what you think and don't forget to check out the store! Their price is very reasonable. Also, you can visit the other DT blog by clicking on the DT team list on my left side bar. Plenty of ideas. I hope you will play along and join the Digi Doodle Shop challenge. I'm looking forward to see what you talented ladies come up with. Hugs, Vera.